Tonight, the skies will open up (some believe, literally) and the moon, mistaking itself for a sun, will burst forth from its tiny silver cocoon, exploding into a brilliant, fiery orb in defiance of the horizon. 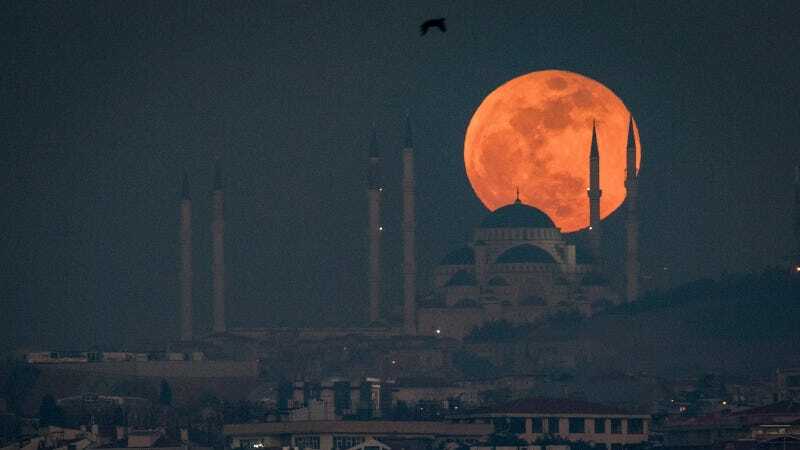 The event is said to be the “longest total lunar eclipse of the 21st century,” which sounds rather impressive until you remember that the century is still a teenager and there is seemingly a new, unmissable celestial event every six weeks. There are a few simple pleasures that distract me from misery in life. Among them: hot spiced black tea on a cold morning; a run during a rainstorm in August; and a clear view of the heavenly sky. I love sunsets, explosions of color racing through the sky every single evening; I love the endless blue of ocean; I love stars and the moon that loom above Earth and glitter brighter than gemstones. I have a memory of seeing a super moon so large that, when I was a child, it seemed like I could walk to the edge of the street and onto the moon. Ever since then, I have always wanted to see another. However, I live in New York City, a jungle of jagged skyscrapers that blocks the sunsets and light pollution that blindfolds the stars. Every time I read about a solar eclipse, a blood moon, or a string of comets hurtling past Earth, I fantasize about leaving this cursed city and setting up a tent in the woods somewhere, anywhere, else. I ignore social media for a day, where all of my non-urban-dwelling friends, fashioning themselves the Martha Stewart of the Cosmos, post poorly rendered, grainy photos of blobs that look like vague approximations of the heavenly bodies we’ve all been reading about, fueling my astronomical FOMO. The events come and go, but I stay in the impenetrable city, a fortress in defiance of nature. This time, it doesn’t even matter how far I drive: the rare, blood-roiling super moon won’t even be visible in North America. I can tune into a video documenting the lunar eclipse, but that is about as sad as watching the Travel channel in lieu of going on a vacation. The moon is a feast for the eyes; she is a large, beautiful hunk of rock that moves the Earth’s tides and inspires cheesy songs, universally loved from every corner of the Earth. Yet I cannot seem to get close to her; I cannot help but feel like the moon, in all her celestial beauty, is cruelly toying with me.